So, let's say you were a patriotic citizen and you saved your fat drippings from bacon, beef, hamburger, ham, sausage, whatever. What would you do with it then? How would you get it from fat contaminated with food particles, flavors, and smells to a nice clean fat you could cook with? Well, that's what we're going to explore today. I'm excited for this one and it's been on my to-do list for a long time! Today's ration recipe comes in two parts: rendering the fat, and then cooking something with the fat. 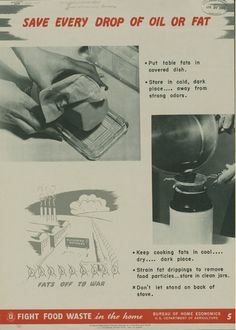 My recipes and information are from two British wartime leaflets that talk about fat - "How to Fry" and "Making the Most of the Fat Ration". I collected fat from several sources - beef broth, bacon drippings, and ground beef drippings. The majority of the fat was bacon drippings and smelled heavily of smoky bacon. I really wondered if I was going to be able to change that into a useful cooking fat. The recipe says to put your fat into a saucepan and cover with water. As the fat melts, it will look a little gross as a thick fat layer floating on top of the water. Blech. Bring it to a boil and then remove from heat. Pour the fat into a container and set it in a cool place, like your fridge. I wanted you to be able to see the water and fat in layers, but my container was too small! After sitting in the fridge, the fat is a nice creamy white and the impurities have mingled in the water or sunk to the bottom. The recipe says to scrape the bottom of the fat to remove any additional impurities that stuck to the bottom, but the bacon fat was much too soft and it all kind of fell apart. I think beef fat is the best as it's a much stiffer, sturdier fat to work with. At this point your fat is ready for baking, but if you'd like to use it for frying or to keep it longer term, you have to cook it again to drive off the water. If your fat has a strong smell (like mine did), the recipe says you can cook a cut, raw potato in it until it's brown which will absorb any flavors/smells. Interesting, eh? The fat will sputter and steam as the water works its way out of the fat and evaporates. Once it's stopped doing that, your fat is ready for frying or storage. Cut potatoes cooking in my rendered fat to get rid of the bacony smell and flavor. I was happily surprised that it didn't smell like bacon anymore! Amazing! As for a recipe, I used the one provided in the "How to Fry" leaflet for Fritters. I've never made fritters and always wanted to try. They are such a simple, and wonderfully easy food to make. For the fritter batter, it calls for 4 oz. flour (about 1 cup), a pinch of salt, 1 egg, 1/4 pint milk and water (1/2 cup with 1/2 milk and 1/2 water). That's it! Ingredients for the fritter batter. Mix it all up. It will make a nice, thick batter. You can use this to dip fish or apples in, or you can add chopped ingredients to the batter and just drop spoonfuls of batter into the hot oil. I opted for the latter, but I wanted to try a sweet and a savory version. Once the batter was made, I divided it into two separate bowls. For the savory I chose their suggestion of flaked fish. I had a tin of canned salmon, so I opened that up and put in about half the can. For the sweet, they suggest using chopped, dried fruit and I felt using cranberries would be appropriate for the Thanksgiving holiday! Heat up your oil on medium heat and fry spoonfuls of the fritter batter. I used a small saucepan to get the depth I needed since I didn't have that much rendered fat. I'd say the fritters took about 5 minutes, flipping several times throughout their cooking. I also made sure to fry my cranberry fritters first so they wouldn't taste like fish from the fish fritters! you would sell it to your butcher to be sent off to the munitions factory. And here they are! The recipe suggested that you could sprinkle a little sugar on the sweet fritters which I took liberty in doing. Both the fish and the cranberry fritters were very tasty! They are such a simple, yet filling food, and so much easier than I thought they'd be! I think it helps that you can just throw the chopped ingredients in instead of worrying about dipping. It saves a lot of time! My husband had the fish ones for lunch. I think they could have used a little malted vinegar. I seriously just need to buy a bottle, already! The cranberry ones were just perfect - the only sweetness being lent by the sweetened cranberries. Here are a few portions from the British Wartime leaflets published in the fabulous book Eating for Victory: Healthy Home Front Cooking on Wartime Rations that I would highly recommend to anyone to buy! "Making the Most of the Fat Ration"
The rest of the pictures come from "How to Fry"
Here are the recipes for the fish and fruit fritters! The celery and cheese fritters look interesting! Happy rendering and frying! And have a wonderful Thanksgiving!